FILE - Afghan Local Police (ALP) keep watch at a checkpoint at Chardara district, in Kunduz province, Afghanistan, June 23, 2015. Afghanistan's government says it will not accept the Taliban’s ceasefire unless it is officially announced. On Sunday, President Ashraf Ghani announced a cease-fire of up to three-months with the Taliban, conditional on the insurgency reciprocating. Taliban sources said their leadership had told local commanders to stop fighting for four days over the Muslim Eid-ul-Adha festival this week, but were unlikely to officially announce anything. Presidential spokesman Haroon Chakhansoori said Monday the government will continue its operations against the Taliban until an official cease-fire announcement from Taliban leadership is made. He also said the cease-fire will hold only for the period the Taliban announce. He added the government wanted a country-wide cease-fire with the Taliban, but said the Islamic State militants would get no reprieve from fighting. The security forces, he said, would continue their operations against IS militants and drug smugglers. Afghan livestock merchants display animals for the upcoming Muslim Eid-ul-Adha holiday, in Kabul, Afghanistan, Aug. 20, 2018. The spokesman also announced the government had asked the Taliban for a prisoner list for possible release over Eid. He said the government would consider releasing Taliban prisoners that were old, sick, or those who had completed their jail terms or declared free by the courts. The Taliban also said they would release a number of prisoners over Eid. But Chakhansoori suggested a prisoner release should be through mutually exchanged lists. The government, he said, did not know whether the Taliban were releasing government prisoners or ordinary people. Meanwhile, Taliban shadow governor of Ghazni Haji Wafa, in an interview aired on the insurgency’s radio station Voice of Shariah, claimed the insurgency controls five districts in the province. He also claimed his fighters controlled the Kabul-Kandahar highway and would only open it for the public upon orders from their supreme commander. Smoke rises from a residential area where gun battle is going on between Taliban and Afghan forces in Ghazni province, Afghanistan Aug. 10, 2018. 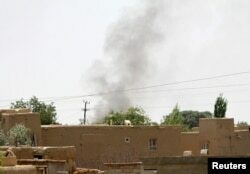 The Afghan government regained control of Ghazni city after five days of intense fighting last week. The fighting created a humanitarian situation with food and water shortages. United Nations agencies estimated around 200 civilians died in the clashes.